The Austrian Silver Philharmonic is among Europe’s most popular .999 fine silver bullion coins. Each coin measures 37mm in diameter and contains one troy ounce of silver. Backed by the Austrian government, Austrian Silver Philharmonic coins are easily converted to cash, making them a sound investment. Also known as the Silver Vienna Philharmonic, this coin is minted by the 800-year-old Austrian Mint. The historic Austrian Mint is known for minting some of the most beautiful coins across Europe. It traces its roots to 1194, when a silver ransom paid to free the captured King Richard the Lionhearted of England was used to create silver coins for the Austrian empire. Today, the Austrian Mint is a leading producer of Euro coinage and gold and silver bullion coins, and is noted for its exquisite craftsmanship and breathtaking coin designs. The Austrian Philharmonic coin is coveted across Europe and abroad, and is highly prized by collectors and precious metal investors. It carries the same design as the Austrian Gold Philharmonic coin, which was the best-selling gold coin worldwide in 1992, 1995, and 1996. In response to demand from investors and coin collectors, the Austrian Mint began minting the same coin in silver beginning in 2008. First introduced on February 1, 2008, this coin is growing increasingly popular each year. Annual mintage is driven by demand, which could make the earliest years of the coin exceedingly collectible in the years to come. The Austrian Mint does not publish annual mintage figures. When leaving the mint, the coins are shipped in 20-coin tubes packaged in sealed, 500-coin Monster Boxes. 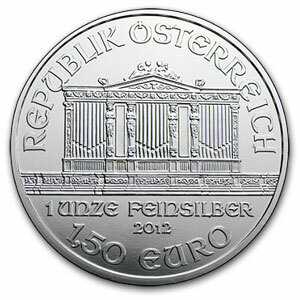 Each Austrian Silver Philharmonic coin carries a face value of 1.5 euro. It is the first silver bullion coin to carry a face value in euros. These collectible coins are legal tender only in Austria, unlike most euro coins, which are legal tender anywhere within the Eurozone. Its actual market value is typically many times the face value, owing to the coin’s silver content. However, Austrian silver bullion typically carries a lower premium than other silver bullion coins, such as American Silver Dollars, making them popular among investors. The Austrian Silver Philharmonic coin can frequently be found at prices that are just a few dollars over the silver spot price. It also features a montage of orchestra instruments to represent the rich musical and cultural heritage of the country. Meanwhile, the reverse features imagery of the Great Organ located in Vienna’s “Golden Hall,” where the Vienna Philharmonic Orchestra performs. This side is also stamped with the country of issue, silver weight, and legal tender value.